firstly chop up the garlic and onions and begin to cook on a medium heat with a splash of olive oil. add in the sugar as well as a little salt and pepper. after 5 minutes, pour in the vegetable stock. let the onions, garlic and stock simmer for 10-15 minutes whilst you blend the pumpkin flesh in a food processor. next, add in the blended pumpkin to the saucepan, along with the coconut milk and soya milk. this is best done a little at a time. stir it all together and continue to heat for another ten minutes. add black pepper to taste. i was kindly sent some of kallos products in the post recently - some organic stock pots, gravy and corn cakes to try. as you may have seen in my last post, i have just started trying my hand at homemade soup and since halloween was just around the corner - pumpkin soup made so much sense! kallo are pioneers in natural and organic food and the only brand on the market to offer organic stock cubes. 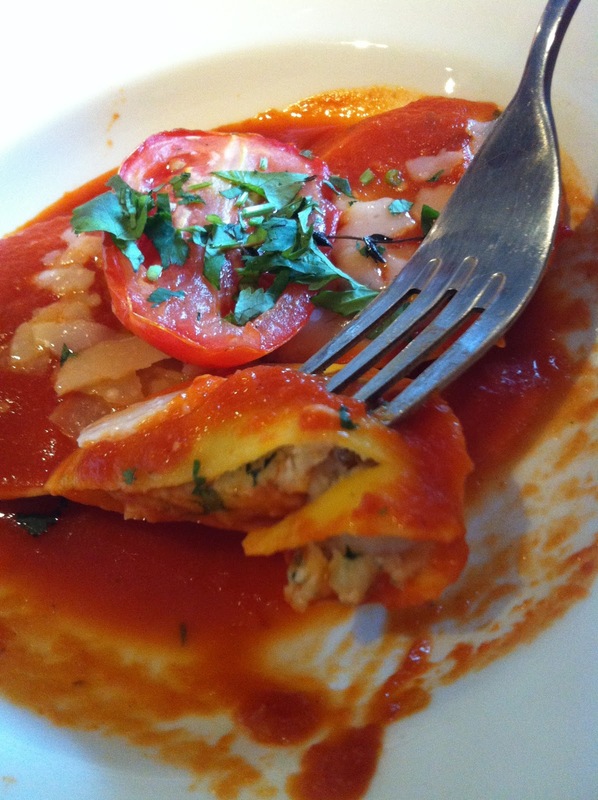 they contain no artificial ingredients, no added msg and are gluten free. best of all... they're full of flavour! personally i love to try seafood, meat, veggie and vegan dishes alike and i luckily don't have any allergies or dietary requirements - but if you do then i'd really recommend taking a look at their other products at kallo.com. oh and here are our pumpkins... happy halloweeeeennn! begin by putting all the onions and leeks in a saucepan with the butter on a medium heat for around 5 minutes. when they have caramelised, add the sliced mushrooms and do the same for another 5 minutes. next, add the vegetable stock and let it simmer for another 5-10 minutes. keep stirring add a little black pepper to taste! finally, put all ingredients in a blender and whizz up until the desired thickness. looking back i would've made mine more chunky - it was so tasty but difficult to take an attractive looking picture. a guilt free chocolate bar? 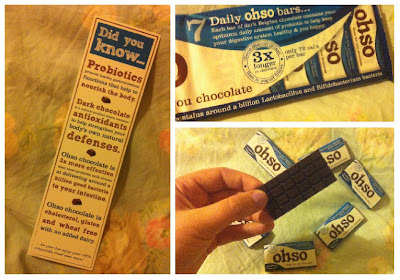 meet ohso probiotic dark chocolate! oh so chocolately. oh so yummy. and oh so... good for you? surely not? i present to you a brand new (almost) guilt free chocolate bar that loves your tummy. ohso probiotic chocolate bars are made from 53% dark belgian chocolate yet also contain the optimum daily amount of probiotic to help support your digestive health. only 72 calories too! i've never really been a fan of the probiotic yoghurt/drinks as i never really saw the point of when i'd drink them. i have cereal for breakfast every day and if i want a snack i grab some fruit (of course the occasional cupcake too!) and i've always thought they seemed quite breakfasty. i have to say though after a meal i do often get that urge to eat something sweet, even if it's just something small. trying these out for a week i really enjoyed having one of these yummy bitesize bars as a sort of pudding. i once heard somewhere it's actually quite good to just have a couple of squares of dark chocolate after a meal to say to your body "i'm full thank you!" i honestly don't know if i felt any different from the probiotic side of things but i'm sure if you tried them out for a while - who knows? most definitely a better alternative to those runny yoghurt drinks any day! the old bulls head, woodhouse eaves, leicestershire. after asking on twitter for a leicestershire country pub recommendation last sunday... i was not disappointed by the reply of "the old bulls head." with the windy country lanes and lush green views, it was hard to believe i was only a 20 minute drive from leicester city centre! there was also a scarecrow festival going on in the village - as we drew nearer we were greeted by straw-like pirates, astronauts and even a scarecrow eating a full english breakfast. i asked for a starter and small version of a main to come out at the same time so that i could try a couple of different things. 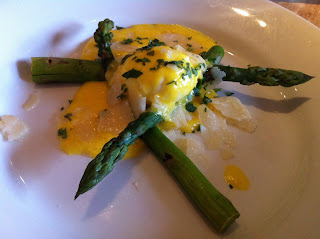 i went for chargrilled asapargus (£6.25) which came with a poached free range egg and hollandaise. 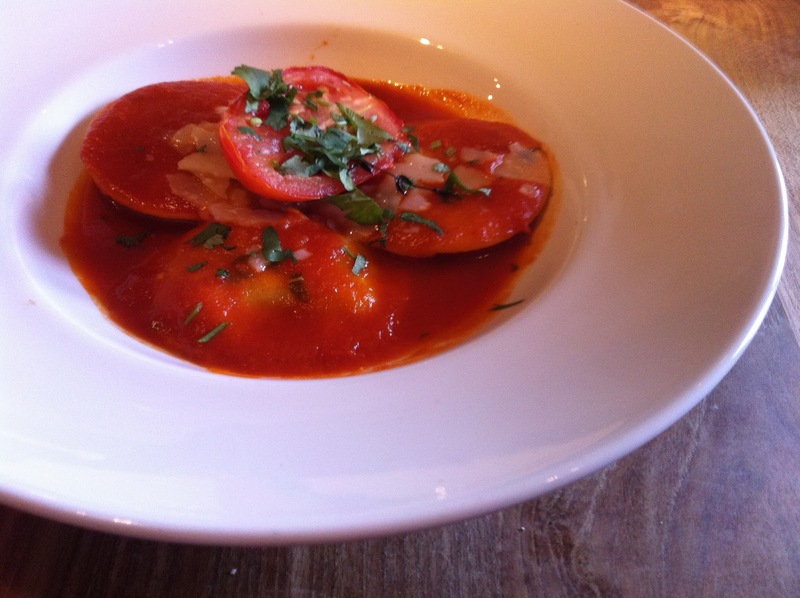 i also had prawn and scallop panciotti pasta (£8.95) - handmade parcels of scallop and prawn with a tomato and saffron sauce. for a large main this was £13.95. to be honest i probably shouldn't have chosen such contrasting flavours as i felt spoilt for choice and could have enjoyed each individually. the hollandaise was perfectly creamy and the egg was just gooey and yum! in comparison, the pasta was delicate and you could actually tell what seafood was inside unlike some other ravioli style dishes.